We are pleased to announce our second Brian Gardner designed theme ModernPaper For WordPress. As is emblematic of his style, Brian has given us a clean, professional look with ease of customization. The name ModernPaper hints at the fact that this theme is well suited for modern publishing of all kinds and straight out of the box has a nice journalistic feel. We wouldn’t be surprised to see this theme adopted by a wide variety of professional online publications, from traditional news to pop media. As with the Nightlife theme, we want you to get the most out of your ModernPaper experience, which is why we’ve created this post to support the growth and maturation of the theme. Feel free to ask questions and make suggestions. Click here for a live preview of ModernPaper. Update: ModernPaper has been updated for compatibility with WordPress 2.7 and up. Download the latest version here. 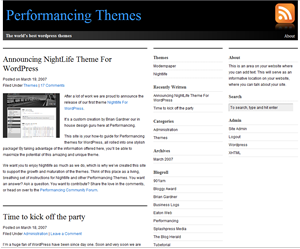 Visit the official Performancing forum for ModernPaper support. I also like this theme very much and am also interested in a two column version if that’s a possibility. The one complaint I have is the tag in the bottom left portion of the header describing it as the “world’s best wordpress themes”. As well there is a recent version in blogger, which in the same place states “now in Blogger” in the same place. I don’t know why these tags are there. I don’t see it in other themes and I feel it really detracts from the theme. I use “ModernPaper” every day. I like this theme very much. I want 2 column theme. Do you have 2 column version of “ModernPaper”?